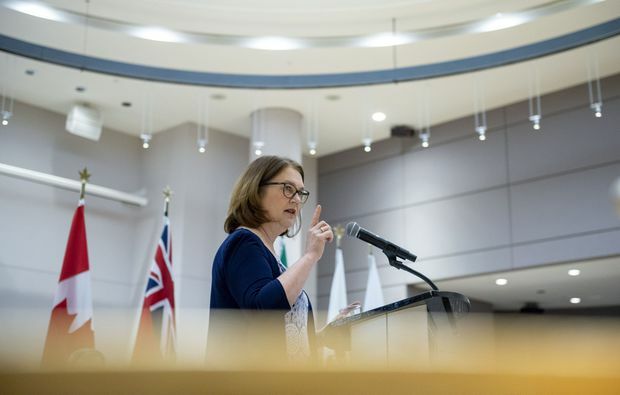 Liberal MP Jane Philpott, delivers a keynote speech at an International Women's Day event at Ottawa City Hall on Friday, March 8, 2019. In the fallout, Mr. Trudeau lost Ms. Wilson-Raybould and Ms. Philpott, as well as his principal secretary, Gerald Butts. On Monday, the Clerk of the Privy Council, Michael Wernick, retired because he said he had lost the “trust and respect" of the opposition parties over his role in the SNC-Lavalin case. Ethics Commissioner Mario Dion has also launched an inquiry, and Conservative Leader Andrew Scheer has asked the RCMP to investigate possible obstruction of justice. Mr. Trudeau said he asked Ms. Philpott “for her help, and she gladly offered" to help convince Ms. Wilson-Raybould to take the position. As a former B.C. regional chief of the Assembly of First Nations, Ms. Wilson-Raybould turned down the job because she did not want to oversee the Indian Act. “The former AG didn’t want to override that, and she had her finger in the dike and said no repeatedly," Ms. Philpott said. “She is someone I look up to as a mentor,” Toronto MP Julie Dzerowicz said of Ms. Philpott. Charlottetown MP Sean Casey said she was a “significant contributor" to caucus. With files from Bill Curry.